I can’t dance. Never could. Something to do with having two left feet, and possibly not wanting to make a fool of myself. I would often say, “I tried tap dancing once. But I fell into the sink.” and laugh. But inside it was no laughing matter. 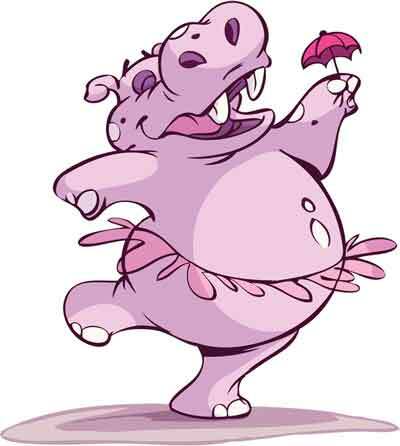 I felt like a hippo – big and clumsy, despite Walt Disney’s best efforts to present them as graceful tutu-clad ballerinas in ‘Fantasia.’ And, of course, fear of making myself look like a fool kept me from even attempting it, even at my wedding (something I know my wife has never forgiven me for, even though she’s never said anything to me about it). My self consciousness translated into a life of intense accuracy. I had to do things right, or else. I could never figure out what ‘or else’ was, except possible embarrassment and humiliation. Whatever it was, I strived for perfection to avoid it. That’s why God was so important to me. If anything says ‘perfection’, God does, and the Bible backs it up – ‘Be perfect, even as your Father in heaven is perfect.’* My whole life with God, my prayers and bible study, my theological studies, all worked towards that. Eventually I was ordained, and carried my diligence into my liturgical duties. I was meticulous about the correct vestments, seasonal collects and prefaces, rubrics, and gestures at the altar, and became irritated if anything was out of place. Everything was carried out with military precision, even down to my sermons being well constructed and obeying all the rules of rhetoric. Oh yes, I was – dare I say – proud of my efforts, except when I made mistakes. Then I would berate myself unmercifully, and analyse what went wrong so that it didn’t happen again. I was also very critical of any of my colleagues whose liturgical performance left (to my mind) a lot to be desired. ‘Just plain sloppy!’ I would think, and was not above passing on my observations to them, to the point that my best friend from college, Michael, took me aside one day and said, “You know, you’re way too uptight. You need to loosen up a little. I know you like to do things right, but you can’t expect everyone else to be the same as you.” I protested indignantly, citing scripture to back up my position. I snorted in derision. Meditation!!? That was an Eastern practice, not to be dabbled in by us good Anglican Christians. Besides, I failed to see how navel-gazing did anyone any good. It was just self obsession as far as I was concerned. No thank you. The discipline of the Daily Prayer Book Offices and the sacraments was all I needed. Then came the time when I went to hospital for a spinal operation that left me bedridden for several long, boring weeks. I’d packed my prayer book and notified the chaplain of my admission, but after a while the Daily Office became sterile and the Chaplain’s efforts in celebrating Communion was substandard – although this time I didn’t say anything. I needed the sacraments too much to criticise. Added to that were sleepless nights. Whoever said, ‘You can never sleep in hospital’ was dead right. My friend Michael visited regularly, and each time I vented my grievances. Eventually even I became sick of it, and when he suggested that I was simply bored and fed up with being immobile, I had to agree. I did know the one, but never used it myself. It smacked too much of the Buddhist Mantras, even if it did mention Jesus. However, I said I’d try. And so we sat in silence for what seemed to be an interminably long time, but which probably only amounted to five minutes. I tried listening to my breathing, but then started to hyperventilate. I heard nothing except the clattering of a bed pan being dropped by a clumsy nurse – which simply served to irritate me more – and the endless chattering of my own thoughts. After he left I began to think more about it. Unfortunately what really irked me, if I was honest about it, was that I’d failed in my efforts to meditate, and that, in a strange sort of reverse psychology way, made me determined to master the art. The night that followed, like so many others, was indeed sleepless. So in the wee hours of the morning I set myself to get this meditation thing right. The trouble is, I had no idea what to expect. How would I know if I was successful? What were the protocols to follow? I resolved to ask the Chaplain to dig up some books on it. This she did, and I devoured the literature, but it didn’t seem to help. It was all too imprecise, too vague. But then an old memory surfaced, of me, aged about four, dancing in front of the TV to some children’s programme music, totally unselfconscious and having so much fun. And the words came: “You can never stuff up. Not with me.” Then, for the first time in a very long time, I relaxed, to the point that my meditation was interrupted by my falling into a deep, dreamless sleep. From then on, in my nightly meditations, we danced, God and I, and my vision was expanded out beyond my hospital bed, out into the world, even out into the universe of suns and planets and galaxies as they danced with the same graceful energy that was sweeping me up into its intoxicating embrace. There was nothing self indulgent about this meditation. In fact I began to see our dancing extending out to other patients and to hospital staff. I saw his grace in everyone, regardless of their own lack of grace – or mine, for that matter. The Daily Office became suffused with new meaning. I learned to savour new and wonderful insights as we danced through Scripture and prayer book. By the way, I still can’t dance, but fortunately having two left feet never seems to get in the way of dancing with God, something for which I am profoundly grateful.